In the days following the 2016 election, a large group of Russians gathered in New York to watch one of their own wage war in miniature. They were at the World Chess Championship, where a patriotic Russian grandmaster was challenging the Norwegian defending champion in Manhattan’s South Street Seaport. Members of Russia’s business and political elite gathered in the venue’s dimly lit VIP lounge and whispered over martinis as their countryman tried to restore Russia to its former chess glory. One person was especially conspicuous, and he wasn’t even there. Kirsan Ilyumzhinov has lorded over the sport as the president of the World Chess Federation, more commonly known by its French acronym FIDE, for more than two decades. But the game’s most powerful figure had been barred from the country hosting its highest profile event. Ilyumzhinov was sanctioned by the U.S. Treasury in 2015 for providing financial assistance to Bashar Assad’s government in Syria as the regime inflicted a shocking degree of violence upon its citizens and purchased oil from the terrorist group ISIS. The sanction was an extraordinary allegation to level against a sports chief, but Ilyumzhinov is no ordinary chief, and chess is no ordinary sport. For years, he served simultaneously as the president of a Russian region and the steward of its national pastime. His authoritarian rule in those dual posts established him as a uniquely valuable Kremlin asset and has led his critics to bestow him with other, less flattering titles. Stooge. Spy. Madman. And perhaps worse. Now, after a 23-year reign atop the game, Ilyumzhinov is days away from the end of his colorful tenure. An election to replace him takes place this week. In a series of interviews with ABC News and FiveThirtyEight, former U.S. government officials, political rivals, criminal investigators, Russia experts, chess insiders, and top players dissected Ilyumzhinov’s career, revealing new details about the mysterious provenance of some of his wealth, the Kremlin connections that critics say kept him in power, and the ongoing battle for the sport over which he presided. Vladimir Putin speaks with Ilyumzhinov during a meeting in the Kremlin in 2006. Like in other elections around the world, Russia has been accused of meddling in FIDE’s election for the top spot in international chess. The portrait that emerges offers a window into how Russia has used sport as statecraft, allegedly currying favor and peddling influence around the world under cover of an ancient board game. Dmitry Peskov, Russian President Vladimir Putin’s press secretary, denied that Ilyumzhinov had ever acted on behalf of the Kremlin. In a wide-ranging and often baffling one-on-one interview, Ilyumzhinov disputed or deflected the allegations against him, portraying himself as a builder and benefactor whose career defies easy classification. Kalmykia, where Ilyumzhinov was born in 1962, would seem an unlikely springboard to power, but that’s where his rapid rise began. One of Russia’s harshest and poorest regions, it is a sweeping stretch of arid grassland home to a largely Buddhist population that was once targeted for exile and extermination by Joseph Stalin. In his childhood years, Ilyumzhinov wrote in his autobiography, he “seemed to be living two lives,” one as a troublemaking child, the other (after a lesson from his grandfather) as a chess obsessive. After a stint working in a factory and then military service, Ilyumzhinov entered the Moscow State Institute of International Relations, one of Russia’s most prestigious universities and widely known for producing two types of graduates — diplomats and spies. He graduated in 1989, having studied diplomacy and Japanese in the midst of perestroika, an era when the Soviet authorities began to allow limited types of private enterprise. “I wanted to become a millionaire,” he said. So rather than enter, say, the foreign ministry, he became a car salesman. Ilyumzhinov said he made a small fortune importing Japanese and other luxury cars and wrote that he turned some “huge profits” on various high-risk, high-reward ventures. According to Michael Khodarkovsky, a professor of history at Loyola University Chicago who has both studied in and written on Kalmykia, Ilyumzhinov quickly established himself among a new breed of post-Soviet powerbrokers. With wealth came power, as impoverished institutions looked to Ilyumzhinov and his considerable resources for a financial bailout. He was elected to the Russian parliament in 1990, at which point, he wrote, he “began to allot money from [his] personal funds” to fill the gaps in the state’s budget. A few years later, in 1993, he was elected president of Kalmykia. He was 31 years old. His first decree was to make chess obligatory in Kalmyk schools. FIDE came calling shortly thereafter, and Ilyumzhinov harbors no illusions about the reason behind the sudden interest in his leadership. In 1995, he was unanimously elected president of FIDE, giving him control of the sport that had long ago captured his imagination. He immediately moved to close FIDE’s debts, spending $2 million, he said, from his personal fortune. It would become apparent, however, that both Kalmykia and FIDE had traded a short-term problem for a long-term ruler whose alleged activities were destined to make headlines around the world for more than two decades. Some headlines were just weird — he has repeatedly claimed he was abducted by aliens in 1997. Others spoke to something more wicked. Ilyumzhinov’s dual tenures in Kalmykia and at FIDE were dogged by scandal. Once dubbed the “King of Kalmykia,” Ilyumzhinov allegedly used his homeland as a base of operations for illicit activity and intimidated those who stood in his way. As Ilyumzhinov prepared to welcome players and delegates from more than 100 countries to Kalmykia for the 1998 Chess Olympiad, the mutilated body of a local journalist was discovered in a pond on the outskirts of Elista, the region’s capital city. Larisa Yudina had been the editor of Sovietskaya Kalmykia, an opposition newspaper affiliated with Yabloko, Russia’s most prominent liberal party. 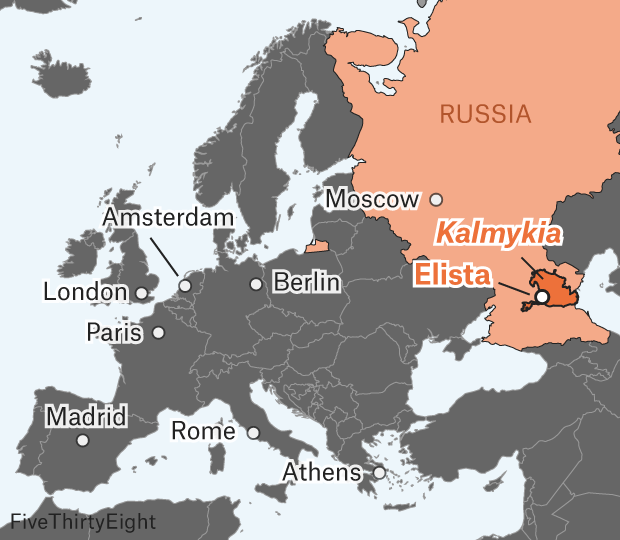 According to two of Yudina’s former colleagues, Valery Badmaev and Batyr Boromangnaev, Yudina had discovered details about a scheme involving Kalmykia’s so-called “offshore zone,” a tax haven from which many of Russia’s best-known oligarchs benefited. Yudina’s colleagues said she was poised to report that money paid by companies registered in the offshore zone was flowing into a presidential fund and foreign bank accounts instead of Kalmykia’s budget. The subsequent federal investigation into Yudina’s murder quickly yielded three suspects — Sergey Vaskin, Vladimir Shanukov and Andrey Lipin — and uncovered a direct link to Ilyumzhinov. The leader Vaskin, a former police officer, was a onetime member of his campaign team. The three men were convicted, and in a Russian court filing detailing their sentences, the judge presiding over the case described how one of the men posed as a disgruntled former employee of an Ilyumzhinov-controlled agency that Yudina was investigating. He appeared to be eager to provide Yudina with compromising documents, luring her to an apartment where she was beaten and stabbed to death. Almost immediately after Yudina’s body was discovered, Yabloko launched its own investigation into the murder, fearing a cover-up by local authorities loyal to Ilyumzhinov. Valery Ostanin, a former police officer with 20 years’ experience, was given full access to the case materials. He called the murder the most “bestial” he had ever encountered. “There was blood on every wall and even on the ceiling,” Ostanin said. According to Ostanin, there was credible evidence linking the murder to Ilyumzhinov, including a flurry of communications between Vaskin and members of Ilyumzhinov’s administration shortly after Yudina’s body was discovered. Yet the investigation stalled, he said, as case materials went missing and key investigators were transferred away. In an interview, Ilyumzhinov acknowledged his acquaintance with Vaskin and his familiarity with Yudina’s reporting, but he dismissed the accusation he had any involvement in the tax scheme or her murder, claiming that he “investigated it specially so that there wouldn’t be conversations” and personally invited the federal agents from Moscow to launch their probe. No charges were ever brought against Ilyumzhinov. Whatever lingering suspicions surrounded Ilyumzhinov following the murder investigation, they don’t appear to have loosened his grip on power. He remained firmly entrenched in his Elista headquarters for more than a decade after Yudina’s killing, where throughout his rule a trio of flags waved overhead — one for Russia, one for Kalmykia, and one for FIDE. In the months following the murder, Ilyumzhinov was re-elected president of FIDE. He ran unopposed. According to Garry Kasparov, then the world’s top player and now an outspoken critic of both Ilyumzhinov and the Kremlin, chess insiders were more than willing to look the other way. Ilyumzhinov maintained a packed travel schedule that saw him unexpectedly but repeatedly appear beside some of the world’s best-known strongmen leaders, typically under the auspices of promoting the game. At times, he appeared to be doing much more than promoting chess. 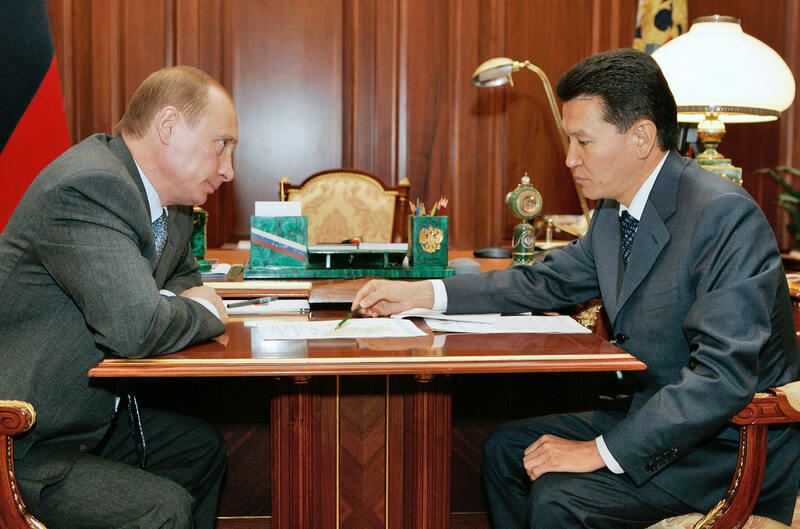 Over the years, Ilyumzhinov has repeatedly been alleged to act as an informal envoy for the Russian government. With 188 national chess federations scattered across the globe, Ilyumzhinov’s opportunities for chess diplomacy were all but endless. Ilyumzhinov, however, scoffed at questions about his association with other autocrats. He denied working directly for the Kremlin but acknowledged that his trips served a dual purpose. He described himself as a “people’s diplomat,” one who promoted not only chess but also “peace and stability.” He became “friends,” he said, with businessmen and politicians around the world with whom he might have casually shared information over lunch. Peskov, who also serves as the chairman of the board of trustees of Russia’s national chess federation alongside other senior Russian officials, denied any connection between the Kremlin and Ilyumzhinov. But Ilyumzhinov’s globetrotting — which his longtime deputy Georgios Makropoulos said was often the largest line item in FIDE’s annual budget — contributed to another fiscal crisis for the federation. Several chess insiders agreed that the FIDE president’s well-publicized association with oppressive regimes made would-be sponsors increasingly wary of association with FIDE. Rex Sinquefield, an American philanthropist and the biggest benefactor of American chess, bankrolls his own tournaments rather than doing business with FIDE. But just as in Kalmykia, Ilyumzhinov’s money and Kremlin connections would make him especially difficult to remove from his perch atop chess. The first serious challenge to his presidency came in 2010, when the Russian former world champion and onetime Communist Party apparatchik Anatoly Karpov ran against him. Karpov initially managed to win the support of the Russian Chess Federation until an armed raid of its headquarters, reportedly ordered by a then-senior Kremlin advisor Arkady Dvorkovich, appeared to persuade its officials to reconsider. The second serious challenge came in 2014, when Kasparov ran against him. He appeared to attract significant support to his reformist agenda until what Kasparov described as “direct interference” by the Russian Foreign Ministry and the network of Russian embassies, including, he said, threats of retaliation and outright bribery, accusations Ilyumzhinov dismissed. It would ultimately take an intervention of the highest order to precipitate Ilyumzhinov’s downfall — and it came from President Barack Obama’s Treasury Department. In 2015, the U.S. Treasury Department’s Office of Foreign Assets Control sanctioned Ilyumzhinov “for materially assisting and acting for or on behalf of the Government of Syria,” which had employed brutal measures to maintain control of its territory amid a popular uprising. Ilyumzhinov vehemently denied allegations that he had assisted the Assad regime, but the sanction created a legitimacy crisis for him at FIDE. Despite that, Ilyumzhinov continued to enjoy a level of state support that revealed how important chess remains to Putin and his inner circle. Peskov called the sanctions “illegal,” pointing out that Ilyumzhinov has never been convicted of any crime. “We’re living in a world of allegations and fake news,” Peskov said. Ilyumzhinov did all he could to combat the sanction. He wrote letters. He hired a lawyer. He even appealed directly to “His Excellency” President Donald Trump, whose alleged affinity for Russia had been dominating headlines for months. None of his efforts appeared to make much progress, so with his colleagues within FIDE urging him to step down, he focused on doing what he did best. By 2017, he appeared set to face his own deputy Makropoulos and English grandmaster Nigel Short, each of whom sought to cast themselves as reformers of a corrupt federation too close to the Kremlin. In October 2017, the U.S. Chess Federation received a letter, which was obtained by ABC News and FiveThirtyEight, from the Russian Embassy in the U.S., urging the federation to support Ilyumzhinov’s candidacy. But just as a financial crisis gave Ilyumzhinov power, it would ultimately be a financial crisis that took it away from him. In January of this year, the Swiss bank UBS moved to close FIDE’s accounts, notifying the federation of the “termination of [its] business relationship.” Bank officials, Makropoulos told us, made it clear in private meetings that FIDE’s accounts had become toxic. Despite the financial problems, Ilyumzhinov remained undeterred. He bolstered his presidential ticket with an American named Glen Stark. But this would-be chess official, it was soon discovered, was neither named Glen Stark nor was he American; he was, in fact, a Russian named Igor Shinder allegedly peddling inflated credentials. This strange scandal appeared to be too much, and Ilyumzhinov’s candidacy suffered an abrupt end — he stepped aside in favor of the Kremlin’s new chosen candidate, former deputy prime minister Arkady Dvorkovich. Ilyumzhinov replaced a resigning president in 1995, and in 1998 and 2002, he was unopposed. The 2018 election is scheduled for Oct. 3. Whether he’s on the ballot or not, the upcoming chess election, like every chess election since 1995, is about one thing: Ilyumzhinov. And like so many elections around the world, the Russians are allegedly meddling in it. Chess leaders have convened in Batumi, Georgia, this week to elect the federation’s first new leader in 23 years. On Wednesday, they will choose between three men — Greece’s Georgios Makropoulos, England’s Nigel Short, and Russia’s Arkady Dvorkovich. But the Kremlin-preferred candidate is the late-entrant Dvorkovich, the former deputy prime minister, who oversaw Russia’s staging of the FIFA World Cup earlier this year. Dvorkovich has supported Ilyumzhinov in the past — he reportedly ordered the raid on the Russian Chess Federation in 2010 — and in many ways represents a continuation of the sport’s alignment with the Kremlin. The contest is facing mounting allegations of Russian interference, including an intervention by Vladimir Putin himself. In a meeting with Israeli Prime Minister Benjamin Netanyahu in July, Putin appears to have offered Netanyahu a deal to shore up support for his chosen candidate. Dvorkovich disputed the interpretation that Putin was pressuring the Israelis to support him, telling the BBC that the Russian president “didn’t do anything wrong” and was merely “informing” his counterpart of an “important” election. Makropoulos has also accused Russia of trying to boost Dvorkovich’s candidacy by promising money, positions of power and gifts — including 2018 FIFA World Cup tickets — to officials who have a vote in FIDE’s election. Dvorkovich acknowledged inviting chess officials to the World Cup but denied providing them with tickets, and responded to Makropoulos’s claims by filing a defamation suit. Peskov said the Kremlin has had no involvement in the candidacies of either Ilyumzhinov or Dvorkovich and rejected any allegations of interference. So Ilyumzhinov’s legacy-defining battle rages on without him. Chess has been established as an effective instrument of “soft power” for the Russians, the former Treasury official said, and a “feather in the cap” like the Olympics or the World Cup that allows Russian leaders to project a polished image to visiting politicians and businessmen. Ilyumzhinov has endorsed Dvorkovich, hopeful that under the former deputy prime minister, the “status” he says he brought to the organization will be “maintained,” but he dismissed the suggestion of holding a position under the new administration should a Russian keep the post. He also suggested he might play a role in the reconstruction of war-torn Syria. According to Ilyumzhinov’s son, David, Ilyumzhinov’s “connections” remain valuable, and his presence can provide a measure of protection and influence in Russia’s notoriously ruthless business environment. He points to the Buddhist temples and “chess palaces” he built in Kalmykia and in countries around the world, monuments to the money he poured into his passions. The actual Chess City in Elista, on the left, and a model of its original, grander plan, featuring a chess-decorated castle, on the right. The neighborhood sits largely neglected in the Russian desert. Elista’s Chess City is one such gift, a relic of the city’s once-favorite son. Built by Ilyumzhinov to host international chess tournaments, it is a convention center surrounded by a semi-gated community that is now home to the city’s small upper class. Its tidy suburban streets are lined with about 150 houses, many of which appeared to be empty, with crumbling facades and broken windows. It is a rundown fantasy sitting neglected in the desert. As his tenure with FIDE comes to a close, Ilyumzhinov envisions a different fate for himself. Asked directly why he was useful to the Kremlin, he bristled at the suggestion that his useful days are behind him. Halley Freger, Emily Ruchalski and Jinsol Jung also contributed to this report. This story was initially developed with the support of The Hatch Institute, formerly The Contently Foundation, a New York-based nonprofit that offers editorial guidance and financial support to aspiring investigative reporters. Madden has since joined its board of advisers. Pete Madden is an investigative reporter in the ABC News Investigative Unit. Patrick Reevell is a reporter in ABC News’s Moscow Bureau.